I was up this a.m at 4.30 as I couldn’t sleep. Was just about to go back to bed at 6.00 when I realized sunrise was not too far off. Actually sunrise is after 7, but there is a time before the sunrises and just after it sets that is called the magic hour. Colors that are not picked up by the human eye, are picked up on film / digital censor. I was outside for about 1.30 hrs and froze my backside off – but I did it with a smile on my face, as it was beautiful. Crisp clean morning, fresh snow on the ground and magic colors. Only when I got inside and checked my iPhone did I notice the temp was 3F / -14C….no wonder I was an ice block. All this beauty unfolds every day around us and most of the time we aren’t even aware…. Thanks Ed, I have played around with Tungsten WB before, however I did it for outdoor portraits. Strange indeed I know. Tungsten WB and then placed Orange warming gels on 2 handheld Nikon speedlights. Colors popped without damaging subject…Tks again for input. So enjoyed your choices thus far, I will be sure to follow you each day. Thank you for stopping by my blog. I have difficulty with brievity. I usually need more tan one photo to explain myself! Truly beautiful, you make want to take photos. Tks for that. Glad to hear I am inspiring people. Great colours, great shot! Thanks for stopping by and the ‘like’ I appreciate! Wonderful. I’m glad (on this occasion) that you got cold! 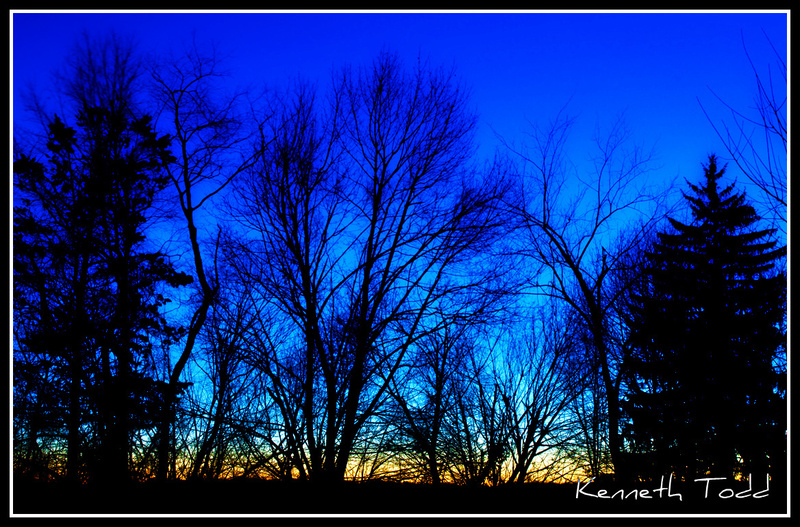 ps, i call it the blue hour. tried to shoot it this morning but it was overcasr and foggy. sad panda. glad to see your efforts were more successful – this truly is a stunning shot. Thanks appreciate the comments. you never know with Sunrise and Sunset, can spend hours, day after day week after week and get nothing. All part of the fun. Thank you and tks for stopping by.